Over the Hedge party theme is extremely popular among many kids. Create fun party atmosphere with the following ideas! To make your Over the Hedge party invitations, get blank white invitation cards. Next, download a group image of RJ, Verne and others from the Over the Hedge gang, and print it on the front of the invitation cards. Write your party details on the inside of the cards. Lastly, decorate the cards with theme stickers. As a variation, you can put a picture of the birthday child (wearing a theme mask or a costume) on the front of the invitations. The wording of your invitations can start with “Attention! (Name) is turning (age)! You’re invited to his (her) Over the Hedge Birthday Party! Join RJ, Verne, Hammy, and others for “El Rancho Camelot” Fun!” Then include the rest of the Over the Hedge party details. Secondly, you can use a theme coloring book. Get the birthday child to color the pages. Then take the pages out, fold them in half, and write your party information around the images. Lastly, you can use Over the Hedge comic strip. Make copies of it. White out “conversations” in “speech bubbles”. Finally, write your own “dialog” that informs the kids about the upcoming party! For Over the Hedge party decorations, use as much green and blue colors as you can. Have Over the Hedge soundtrack playing outside, and DVD – inside the house. Print images of Over the Hedge characters, and decorate your fence with them. Put up a banner that says “Welcome to El Rancho Camelot Estates.” Create a balloon arch by tying balloons to a kite string (about 12″ apart). Then secure the ends of the string with dowels on both sides of the driveway – so the kids have to go through the arch when they enter the yard. Simulate a hedge in you yard by positioning a large board and decorating it with green streamers and material. Spread out animal plush toys or bean bags around the area. Inside the house, hang Over the Hedge posters on the walls. Borrow a red wagon and blue cooler (to simulate Vincent’s goods), if you can. Fill them with various food items (use movie as a guide). Spread some more food around the house: cans, Girl-scout cookies, Pringle® chips, etc. Place a grill on the patio or balcony. You can cut out a van shape out of a sturdy board, and paint it like the Verminator’s van. Fill the ceiling with blue and clear helium balloons to represent the sky and the clouds. Hang a personalized “Happy Birthday” banner in the center of the room. Cover your Over the Hedge party table with a theme cloth. Put plush animal toys in the middle of the table for a centerpiece. Tie colorful balloons to the chairs. *Animal Transformation: Transform your Over the Hedge party guests into various animals from the show (raccoon, turtle, bear, skunk, squirrel, etc). Apply face paint on their cheeks. Provide the kids with extra costume accessories (masks, tails, etc. ), if possible. Start calling them by character names from the movie (e.g., RJ, Verne, Hammy, Vincent, etc). *Coloring Pages: Invite the younger kids in your group to color Over the Hedge coloring pages with markers and crayons while they are waiting for others to arrive. *Sandy Candy: You can get “candy creation” kit from a party store. At activity time, have the kids create colorful candy concoctions that they can eat after dinner. Hand out such Over the Hedge party favors as Hammy the Squirrel masks, gumball machines, Over the Hedge sticker sheets, blowouts, cups, toy binoculars, and so on. *Pin the Nose on RJ: To start off your Over the Hedge party, play a version of classic “Pin-the-Tail” game. You’ll need a poster of RJ: purchase or make one yourself – by printing and enlarging an image of RJ onto a poster board. Draw and cut RJ’s nose shapes out of brown construction paper (enough for each guest). Put double-sided tape and write kids’ names on the back of the shapes. Mount RJ poster on the wall. At game time, blindfold the kids one by one, spin them around and get them to stick their nose shapes on RJ where they belong. *Hammy’s Peanut Hunt: Before the Over the Hedge party, hide peanuts throughout your house or yard. (You can wrap several nuts together in plastic wrap to keep them clean.) At game time, get the kids to transform into squirrels and have them find their meal. Give each child a sack and reward all the “squirrels” with small prizes. *Escape from Verminator’s Hands: Pick one or more players to be the “bad guys” (the Verminator or Gladys), and the rest of the players will be the “animals.” When Bad Guys hear the command “Get ’em”, they must try to catch as many animals as they can. If players get caught, they must go to a designated area called “The Verminator’s van” where they must stand perfectly still with their legs spread apart. To be rescued, one of their animal-buddies has to crawl through their legs. Keep playing the game until everyone has been caught, or it’s time to move to the next game. *Feed the Bear: Make or purchase a poster of a bear. Attach the poster to a large box for support, and cut out the bear’s mouth. Get the kids to throw bean bags (or socks filled with beans) into the Vincent’s “mouth”. Kids will most likely want a second go around. *RJ, RJ, Vincent: There is a scene in the movie where Vincent chases RJ. So you can change a classic “Duck, Duck, Goose” game into this Over the Hedge party version. Have your party guests sit in a circle. You can start the game by having one child going around the circle tapping each player lightly while saying “RJ.” When he or she says “Vincent”, the tapped guest will get up and chase him or her around the circle. The goal is to tag the child before he or she can sit down in the open sit. If Vincent succeeds, he gets to go around and tap other players repeating the process. *Pull My Tail: Stick material or paper animal tails onto the waist of each player with tape. Get the kids to spread out around the play area. On the command “Go!”, have them try to collect as many tails as they can from one another, while trying to keep their own tails. Whoever collects the most tails wins a prize. *Who am I? : Write the names of Over the Hedge movie characters (or the names of animals will do) on strips of masking tape before the party, so each child will have one. For younger kids, you can use stickers or pictures of the characters. At game time, attach a name to each kid’s back, but don’t let them see it. Children must figure out what character is on their back by asking everyone else questions that can be answered “yes” or “no.” For example, the questions can be “Do I hibernate?” or “Do I like cookies?”, and so on. *Over the Hedge Obstacle Course: For this Over the Hedge party game, you’ll need a wagon, food containers, and several obstacles along the way (orange cones, chairs, pile of trees, toys, etc). Challenge the group to pull the wagon through the course, while picking up all food containers on the way. Time the kids to see who can be the fastest! Encourage all the guests to cheer their friends. *Animal Parade: Before the Over the Hedge party, tape a “paw print” trail (poster board cutouts) on the floor around the house or yard. At activity time, have the kids line up behind the birthday child (wearing their masks and face paint and/or having their costume accessories on). Get them to march around following the paw prints. You can play Over the Hedge soundtrack to accompany the little “animals”. This is a great opportunity to take lots of pictures! *Watch the Show: At the end of the party, invite the kids to unwind and watch a fragment from Over the Hedge movie while they are waiting for their rides. *Over the Hedge Cake: Bake a rectangular or round cake according to package directions. Frost it with icing. Write “Happy Birthday” message with decorator gel. Then place Over the Hedge cake toppers on the cake. *Vincent’s Spuddies: Bake potatoes and serve them with topped salsa, cheese, beans, beef, etc. *Hammy’s Cookies: Bake birthday child’s favorite cookies. *“Over the Hedge” Punch: Fill a large punch bowl with lemon-lime soda. 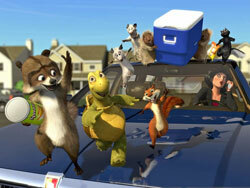 At Over the Hedge party time, add green sherbet and watch it fizz!